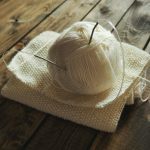 If you are just starting out on your knitting journey, then you will most probably be looking online for some easy knitting patterns beginners can use. There are many sources of knitting patterns beginners can use online, but sometimes it is better to have a book that you can open anytime and make a pattern choice at your leisure. If you want a free knitting pattern, scroll down and learn how to make some beautiful vase covers. Here are some great knitting pattern books you can purchase online, and they will give you hours of knitting pleasure for less than the price of a cup of coffee. What’s not to love about this little book. It is absolutely free to download. When the weather is cold and the breeze is cool, nothing soothes the soul quite like a warm and cosy scarf. Instead of buying a generic accessory from an expensive boutique, stay in and keep warm with these free scarf patterns. Veteran knitters know just how fun and easy it can be to create your own handmade creation and now it’s time for you to find out to discover this sentiment, too! You will have to know how to read a knitting pattern for this one, or see the most common abbreviations here. This is a great book for both beginners and people who have been knitting for years. The book covers a huge variety of stitches, and you can expand on your existing skills, or perfect your technique. There is step by step instructions with pictures that walk you through from how to hold the yarn and needles to more advanced techniques. At this time the book is still a bargain at $3.41. Improve your ability to follow knitting patterns and create beautiful completed projects. Learn how to read a knitting chart or any knitting pattern. Learn to knit quickly and easily with colour pictures and step by step instructions. Learn the difference between the English and Continental Methods of knitting. 15 great knitting patterns included. Top five tips for beginner knitters. Includes 20 different knitting stitches and 12 unique knitting techniques. It is Knitting for Dummies on Steroids. There is simply no better resource online that I have found for starting off in knitting and also improving on what you already know. All the books above have knitting patterns beginners will love. Here is another free knitting pattern for beginners you may enjoy. It is a colourful vase knitted in graduated stripes. Once knitted they are felted and stretched over plastic bottles. Both vases are knitted in stocking stitch with 10mm needles. You will need a straight-sided plastic bottle 7cm in diameter and at least 20 cm high for the small vase, and one 10cm diameter and 30cm high for the large vase. 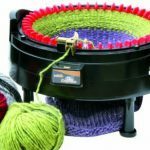 Felting is a technique where you knit on large needles, then shrink down by machine washing with a hot wash cycle. Two strands of yarn are used together to knit each vase. 3 different shades of wool and 1 ball of each to make a small and a large vase cover. I used Aran 100% wool that is suitable for felting like the one on the left. Order online by clicking on the ball of wool at the best prices from Amazon. 10mm Knitting Needles like the ones on the right of the page. You can order them directly from Amazon by clicking on the picture. Using the 10mm needles and 2 strands of your first colour together, cast on 5 sts. Row 1: k into front and back of each st. 10 sts. P 1 row. Row 2: k into front and back of each st. 20 sts. Beg with a p row, work 5 rows st st.
Cut off 1 strand of colour and join on 1 strand of your second colour. Using two different colours together now for a graduated colour change work 8 rows st st.
Cut off the first colour and join on a second strand of the same second colour. Work 4 rows st st.
Cut off 1 strand of the second colour and join on 1 strand of the third colour. Using two colours together work 4 rows st st.
Cut off the second colour and join on a second strand of the third colour. Using 2 strands of third colour tog work 8 rows in st st. Cast off and join the seam. Using 10mm needles and 2 strands of the first colour together, cast on 7 sts. Inc Row 1: k into front and back of each st. 14 sts. Row 2: *k1, k into front and back of next st, rep from * to end. 28 sts. P 1 row. Row 4: *k3, k into front and back of next st, rep from * to end. 35 sts. Beg with a p row, work 7 rows st st.
Cut off 1 strand of the first colour and join a strand of the second colour. Using two colours together for a graduated colour change work 6 rows st st.
Cut off the first colour and join on a second strand of the second colour. Using both strands together work 6 rows st st.
Cut off 1 strand of the second colour and add a strand of the third colour and knit tog 6 rows st st.
Cut off the second colour and join other strand of the third colour. Using two strands of same colour together, work 21 rows st st.
Set the washing machine to its hottest wash program. Put the vase into the drum with an old white towel and two or more eco washing balls. Add washing detergent and start the machine. When the cycle has finished, remove the vase and stretch it over the bottle of your choice while it is still damp. Leave the vase in an airing cupboard until completely dry for at least 24 hours. 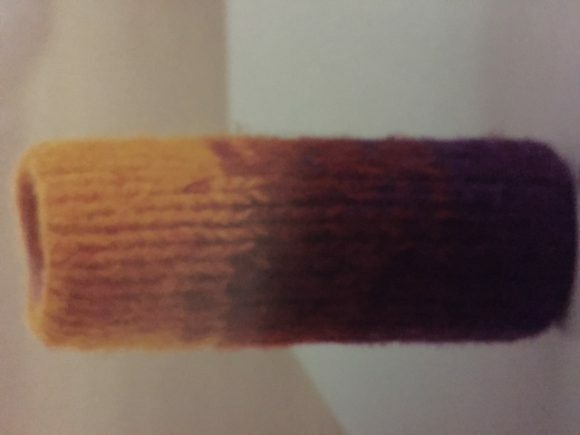 Following the top edge of the knitting draw a line around the bottle. Remove the knitting and carefully cut along this line. Smooth any sharp edges and then replace the bottle in the felted vase. Before using the vase, put a few stones or weights in it to weigh it down and give it stability. What a cute idea. My wife has been wanting to start knitting. It is such a great past time to relax (so long as the knitting is not stressing you out with trying to figure out where you went wrong 🙂 ) But I have not seen vases done before. They would be such a personal touch if you send flowers to some one with your knitted vase. Especially in the winter, that would be so sweet. Thank you for all points to help with knitting patterns beginners can start knitting. We will let you know how it works out. Thanks for stopping by Michael, and hope your wife enjoys getting going with her knitting. Looks like a good introduction for those who want to venture into knitting! I just want to ask though… Can crochet toys/patterns be made using these knitting techniques? I understand that crochet and knitting are similar, and if that is so, what advantages does knitting have over crochet and vice versa? I think you need to be extremely clever to convert a crochet pattern to a knitting pattern. The techniques are totally different. I enjoy crochet from time to time, but find it much easier to knit. Different strokes for different folks though. However, I wouldn’t say one has more advantages over the other, as both allow the crafter to make beautiful items. These vases are such a cute idea. I would definitely need to get the A to Z guide first. I often see hand knitted items and would love to learn. For some reason, I never got the hang of knitting although it’s been a long time since I tried. My grandmother tried to teach me as a teen. She was successful at teaching me to crochet, but knitting just didn’t stick. It might be time to give it another shot. Thanks for the info. Give it a shot Linda, you will probably enjoy it more now. My Gran tried to teach me to crochet, but was never much good at it.